The Place There are many new developments along Orchard Road this year, one of them being Orchard Gateway, a new mall linked to Orchard Central with a brand new Hotel Jen above the mall. Hotel Jen is the Shangri-la’s Hotel Group rebrand of the former Traders Hotel name, with its own restaurant at the level 10 lobby, Makan@Jen. We were excited to check out the buffet dinner at Makan@Jen, which has Seafood theme on Friday and Saturday, while the rest of the week is International Buffet theme. At $55++ per person for the weekend Seafood buffet, the price is fairly competitive as compared to other 5 star hotels in Orchard Road. There is a current OCBC promotion where 1 dines free with 3 paying adults. The layout of Makan@Jen takes on an open concept setting, where you can enjoy the full work of the chefs in the kitchen. The layout of the tables is quite cosy and intimate as well, with great views of the city by the window and a relatively spacious dining area. 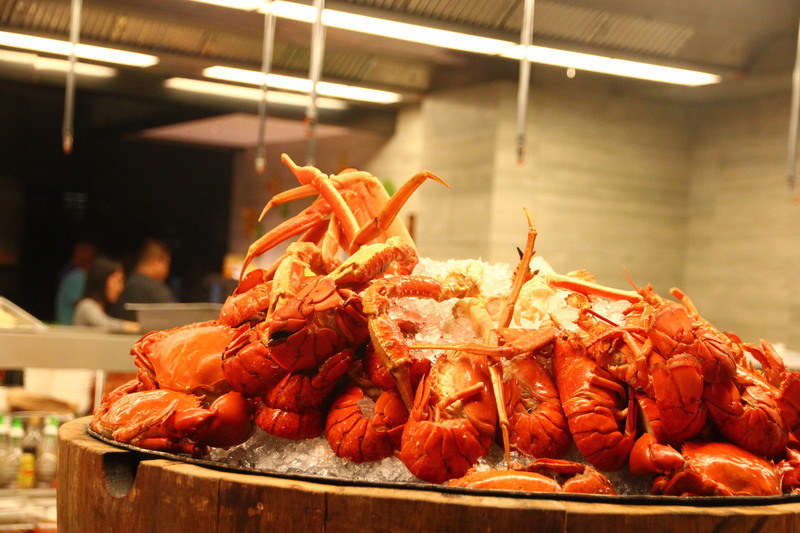 The Food As compared to the International theme, the Seafood theme on weekends boasts selections such as Chilli Crab, Crayfish, Lobster, Tiger Prawn, Grilled Salmon and Squid. Seafood aside, we spotted the ubiquitous Japanese counter with the usual sushi and sashimi, an extensive salad station, oriental selection such as a live prawn noodle station, roasted pork and duck, oyster omelette and dim sum such as siew mai. Rants While some may find that the buffet spread is not the most extensive around, it is fairly sufficient for our liking. Will I return again? If you are in Orchard and fancy a cosy dinner buffet away from the crowd, Makan@Jen would be worth considering. Make your reservation instantly at Makan@Jen here.